Go and read more here. And please feel free to share: Twitter / Facebook. Sometimes advocacy succeeds & Microsoft notices. Hopefully they fix this soon. But I wonder if there is some sort of hack you can do to get around it. I wonder if they have a bandwidth cap from how their core architecture is from an OS standpoint. Human eye can't see more than 512Hz, confirmed by Microsoft. Arbitrary limits are not uncommon in software. Sometimes you just pick a limit that seems adequate at the time. This is code that was written many years ago, where these resolutions and refresh rates seemed like science fiction. RealNC wrote: Arbitrary limits are not uncommon in software. Sometimes you just pick a limit that seems adequate at the time. This is code that was written many years ago, where these resolutions and refresh rates seemed like science fiction. Credit where credit due, yes, these refresh rates were indeed science fiction not too long ago. Even five years ago, I was very doubtful we'd reach consumer-accessible 1000Hz within our lifetimes, but my confidence level has reached >90% we'll get there by 2030 because of what I know now. And by "uncap", I mean elimination of all refresh rate caps -- nothing hardcoded. Not even 1024Hz, not even 2048Hz. This Windows10-only link launches the Microsoft Feedback Hub application on Windows 10. 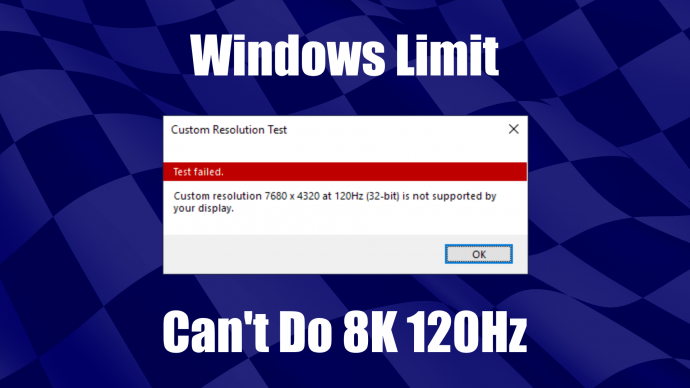 This is the bug report supplied to Microsoft about the Windows 512 Hz limitation. Windows can't go above 512Hz.